The pet food world is full of delicious and nutritious meal options for pets. We love to spoil our four-legged friends with foods containing hearty ingredients like bison, beef and wild-caught salmon. With a mixture of delectable dishes to choose from, it’s hard to believe our pets would prefer to chow down on bowl of rocks or a cardboard box. Many pets suffer from a disorder known as pica, where they eat non-food items. While most cases can be fixed with training and persistence, certain types of pica can become very dangerous to your pet’s health. 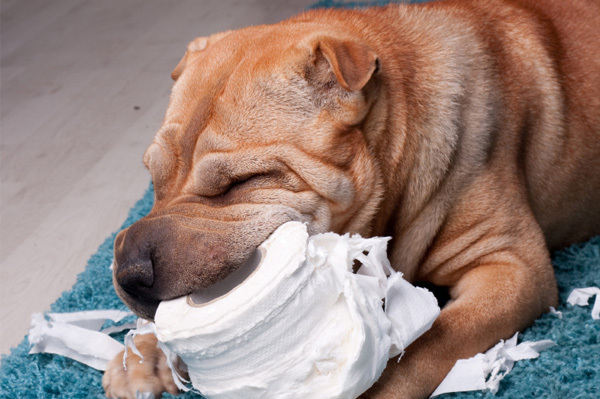 If your furry friend enjoys snacking on a roll of toilet paper — or worse, a poop morsel — here’s the story behind these strange eating behaviors. Add new toys and games to your pets’ toy box. Set aside dedicated play time. Exercise with your pet daily. Keep restricted items like boxes, socks, pens or any other non-edible items out of reach and replace them with pet-friendly toys and games. For an extra treat, try toys that can be filled with a tasty surprise to help pique your pet’s interest. Always reward good behavior with ridiculous amounts of praise. Create one-on-one time for you and your pet that incorporates exercise. Make sure small non-food objects are out of sight (and reach) to avoid any possibility of your pet choking. Familiarize yourself with the list of pet-toxic food items you may have in your household and keep those items well out of reach. Always unplug electrical items that are within your pet’s chewing reach. Some pups tend to eat grass to relieve upset stomachs or symptoms of nausea. Eating grass can sometimes help them improve digestion or help them vomit when nauseated. Light grazing can be acceptable but a trip to the veterinarian is encouraged if your pooch makes grass-eating a regular part of her daily diet. What is the strangest thing your dog has eaten? Share in the comments below!